easySpeak is a powerful tool that is used by many Toastmasters clubs across the globe to help members track and support their own development and to significantly enhance the meeting planning process. Each member will have an account for two systems: Toastmasters International for access to Pathways and easySpeak for club participation activities. Take a meeting role – when you take a role in advance, you are more proactive in your development and it reduces the amount of time spent at the end of each meeting arranging the following meeting. Request speeches – let the VP Education know when you would like to speak. S/he will schedule your speech and confirm the date with you. The sooner you make your request, the better chances you have of getting your preferred date! 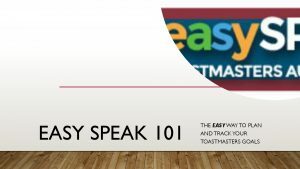 To guide you through easy Speak, check out this handy easySpeak 101 resource.